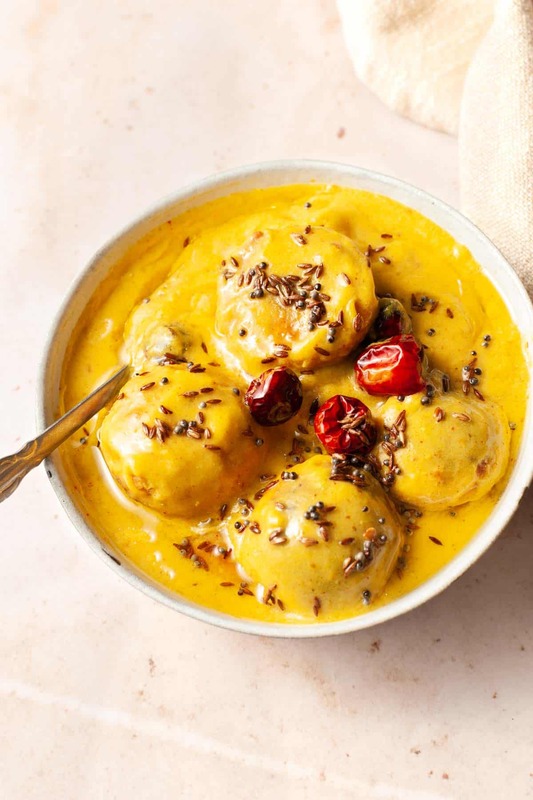 Kadhi pakora or Punjabi kadhi is the perfect vegetarian comfort food from North India. 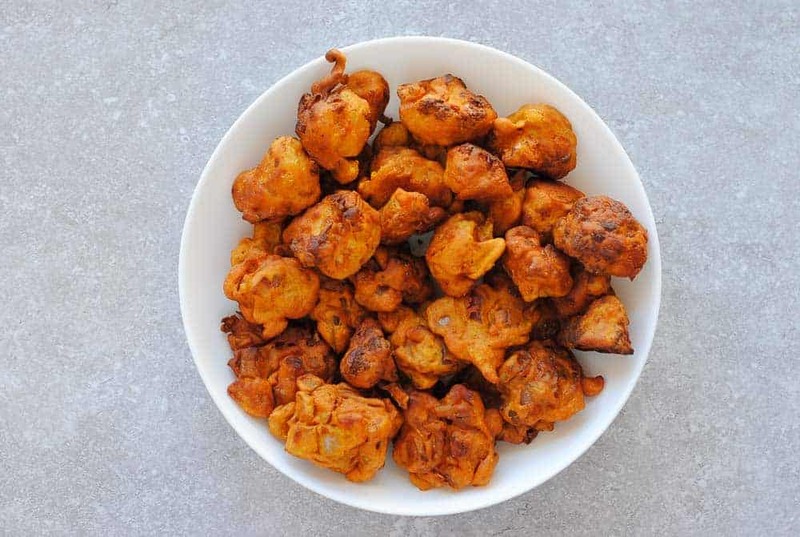 Vegetable fritters (pakoras) are coated in a chickpea flour mix and fried to golden-brown perfection. 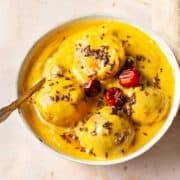 The pakoras are then dipped in a sunshine-yellow sauce (kadhi) made with yogurt, chickpea flour, turmeric and other spices. Mmm! When it comes to comfort foods from North India, nothing can beat kadhi pakora and rajma masala (kidney beans in sauce). These are hearty Punjabi dishes with a touch of rusticity that will appeal to anyone with a sense of adventure. I am not from Punjab (an Indian state where people thrive on dishes made with real butter, ghee, paneer and yogurt), but I adore the food. Sort of inevitable after having spent my teenage years in New Delhi, a city where the food scene has a rather strong Punjabi influence. Butter chicken or dal makhani, anyone? mustard oil (optional) – mustard oil is used for frying the fritters. It is not strictly necessary though and you can replace it with canola if you don’t want to experiment with a new oil. Most of these ingredients are easily available in Indian grocery stores or even the international aisles of supermarkets like Walmart. Ginger-garlic paste can be made at home in a snap. Peel equal quantities of ginger and garlic and put them in a blender with a little water. Blend to a smooth puree and store in a glass jar with a lid. Keeps in the fridge for a few weeks. Mustard oil is wonderfully spicy and flavourful and once you’ve had a taste, every other oil will seem bland in comparison. If you do decide to use it, you will need to smoke it first to get rid of the sharp, raw taste. This is how you prep mustard oil for cooking: pour the oil in an aluminum or steel pot and heat it until it reaches smoking point. When it starts fuming and changes colour (to pale yellow), it’s done. Switch off the gas and allow the oil to cool down before using it. You will want to switch on the exhaust fan in your kitchen and open a few windows to get rid of the fumes after you’re done smoking the oil. Take the chickpea flour in a large bowl and add chilli powder, turmeric powder, garam masala and salt. Add the yogurt. Then add a few tablespoons water little by little and mix to form a thick batter. 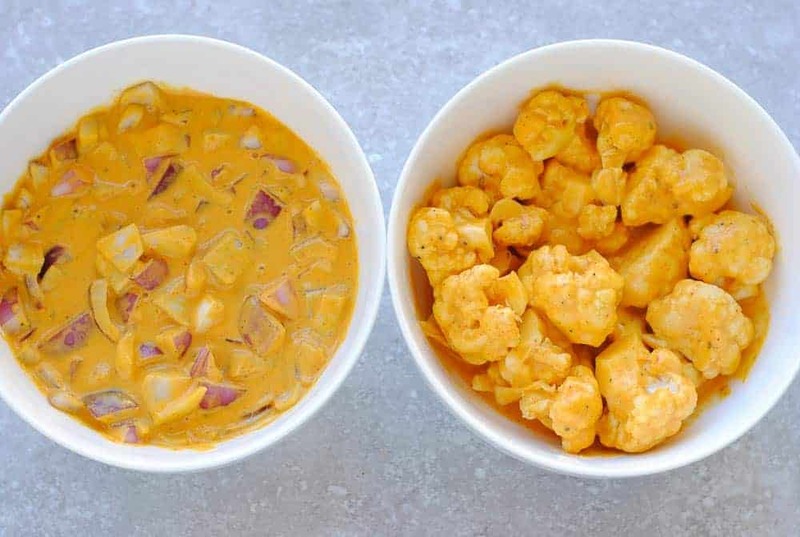 Divide this batter into two bowls. Mix in the chopped onions in one part and cauliflower florets in the other. Heat oil in a skillet and drop teaspoonfuls of batter in the oil. Fry over a medium heat until golden. Remove from the hot oil and set aside. Place the yogurt in a deep bowl and whisk with a wire whisk until smooth. Add the chickpea flour, ginger-garlic paste, ground spices (# 6 in ingredients list above) and salt. Use the wire whisk again to make a smooth paste. Transfer the mixture to a heavy-bottomed wok or dutch oven and add 4 cups water. Stir with a wooden spoon to mix everything. Cook on high heat until the mixture comes to a boil. Stir continuously in a circular motion with a wooden spoon. Lower the heat and cook, uncovered for 30 minutes. Stir frequently to make sure the sauce doesn’t stick to the bottom. 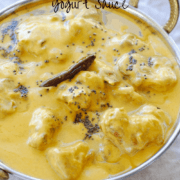 When the liquid thickens and becomes a smooth sauce, the kadhi is cooked. 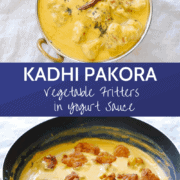 Add the fritters to the kadhi and cook for a few minutes so that the fritters absorb some of the sauce. Pour the kadhi in a deep serving dish. Heat a little canola oil in a small frypan and add the mustard seeds. When the seeds start popping, add the dry red chillies. 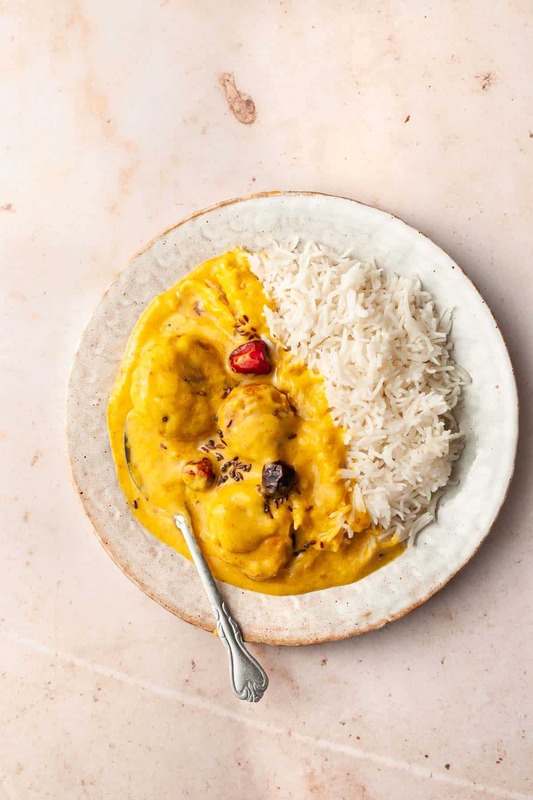 Pour this spice-infused oil over the kadhi and serve hot with steamed rice. 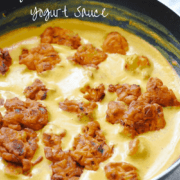 Use sour yogurt for making kadhi. If it is not sour, the kadhi will not have that zing and then it’s no fun. Yogurt sitting in the fridge for a few days is usually sour. Use this yogurt, not the fresh one you got from the supermarket today. While making the batter for the pakoras (step 1), don’t add too much water, too suddenly. The aim is to make a thick batter so that the pakoras turn out round and plump. With Indian bread like chapati or roti that are like tortillas (flat, unleavened rounds made of wholewheat flour). With steamed Basmati rice – this is a very popular combination called kadhi chawal. 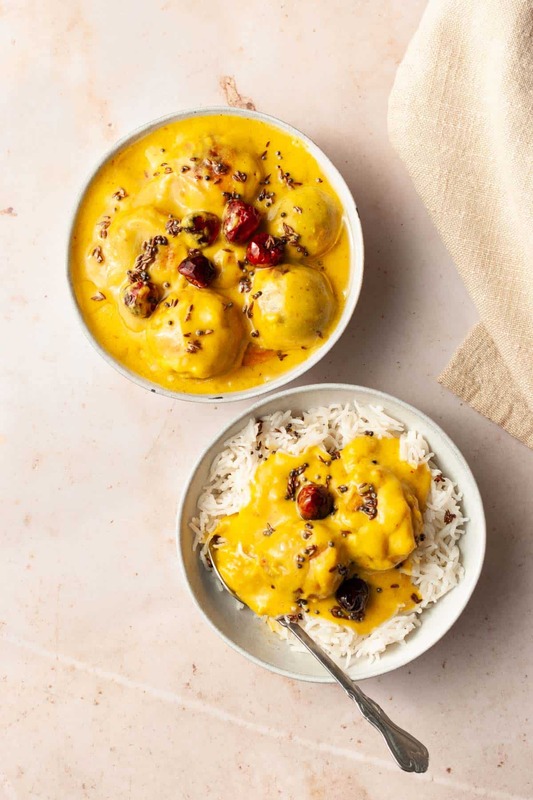 Kadhi tastes fantastic when poured over rice and makes for a complete, very satisfying meal. In a bowl, add the chickpea flour and the dry, ground spices – red chilli, turmeric, garam masala and salt. Mix well and add yogurt. 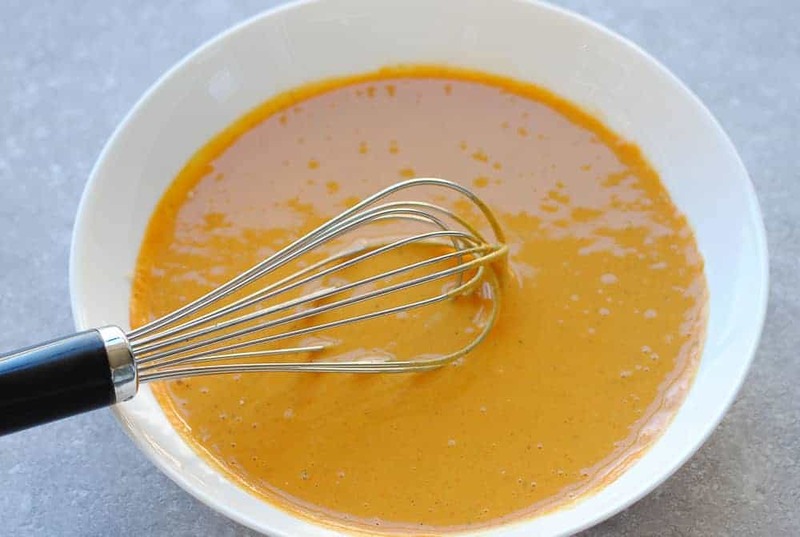 Then, add a few tablespoons of water little by little and mix together with a whisk to form a thick batter. Divide this batter into two bowls. Mix in the chopped onions in one part and cauliflower florets in the other. Heat the mustard oil in a wok to medium-hot and drop teaspoonfuls of batter in it. Fry until golden brown. Remove the fritters from the hot oil and set aside. Place the yogurt in a deep bowl and whisk until smooth. Add the chickpea flour, red chilli, turmeric, coriander, garam masala and ginger-garlic paste, and salt. Use the wire whisk again to make a smooth paste. Cook on high heat until the mixture comes to a boil. Stir continuously in a circular motion with the wooden spoon. Lower the heat and cook, uncovered, for 30 minutes. Stir frequently to make sure the mixture doesn’t stick to the bottom. 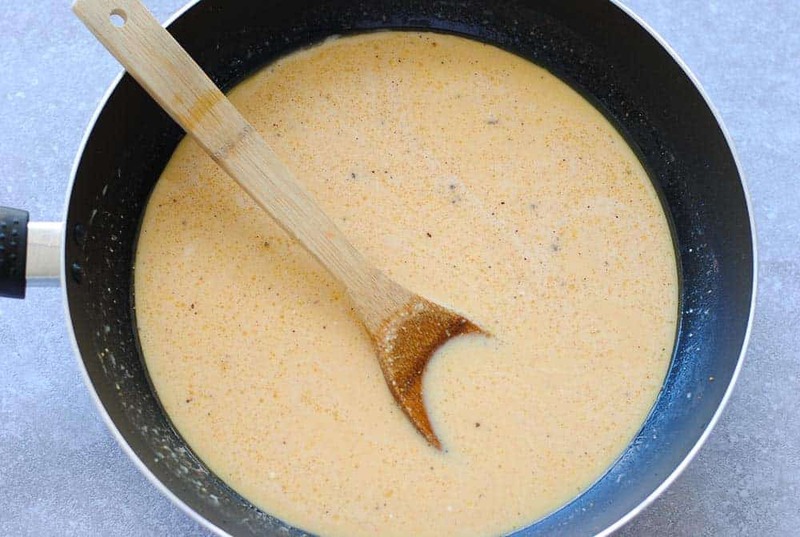 When the liquid thickens and becomes a smooth sauce, the kadhi is cooked. Heat a little canola oil in a small frypan and add the mustard seeds. When the seeds start popping, add the dry red chillies. Pour this spice-infused oil over the kadhi and serve hot with Indian bread or steamed rice. Leftover kadhi can become quite thick when kept in the fridge. While reheating, simply add a little water and cook for a couple of minutes. It will become smooth again. Since the pakoras are deep-fried, there is no way to get an accurate calorie count. What follows is a best estimate. 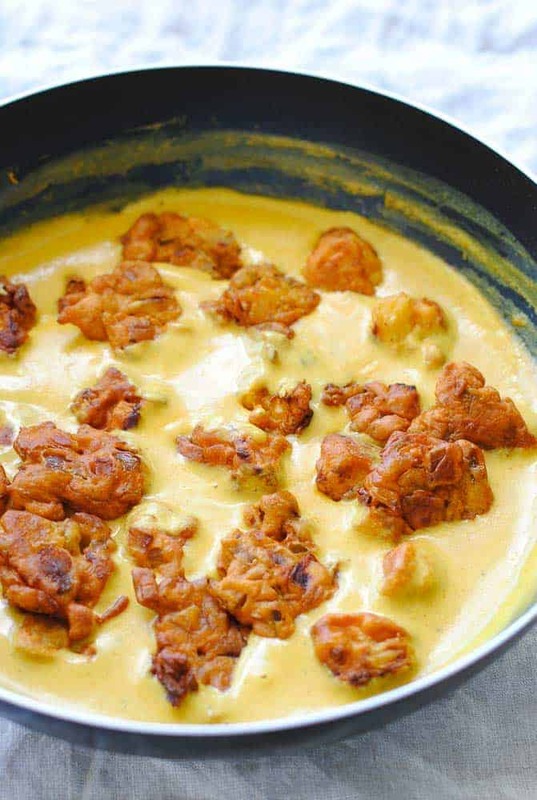 Did you make this kadhi pakora recipe? Don’t forget to give it a star rating below!